ICAM has over 45 years of consistently producing new technologies and innovations within its product line which has now led to its announcement of the next generation of NC post-processing – Adaptive Post- Processing™. Adaptive Post-Processing™ is the marriage of several innovative software modules, developed at ICAM Research, that work simultaneously with each other within an post-processing and simulation environment. The concurrent operation of these integrated modules allows ICAM customers to realize the following unique benefits. Because the ICAM Adaptive Post-Processing™ and Simulation solution fully understands the machine’s kinematics, spindle power, workpiece, the machine environment, the NC controller and tool cutting conditions, it is able to automatically remove any undesirable and inefficient air-cuts and unsafe approaches of the tool to the workpiece. While automatically correcting for these expensive NC program inefficiencies, ICAM Adaptive Post-Processing optimizes the machining feed-rate based on tool engagement into material, while respecting your tool recommended chip-loading data; all of which help reduce machine cycle time by up to 25% ! Because the ICAM Adaptive Post-Processing™ and Simulation solution allows the user to simply write CAM programs for the part, thereby eliminating the traditional and time consuming habit of programming for specific machine, it is now possible through ICAM’s innovative technology to “program the part” just one time and then chose the best machine available to produce the part. And should that target machine suddenly become unavailable? Re-post-processing is all that is needed for the new target machine. Yes!.. even with dissimilar controllers and different kinematics, the change of a program from one machine to another is effortless. ICAM’s Adaptive Post-Processing™ and Simulation solution integrates with all popular CAD/CAM systems such as CATIA, NX, PTC creo, PowerMILL, Mastercam etc., allowing you to buy only one post-processor and simulation software solution for the CNC machines you have regardless of the CAD/CAM system you use to program parts. 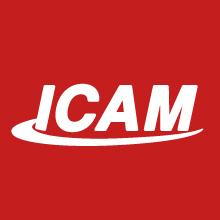 This new freedom allows your investment in ICAM products to live as long as you own your CNC machine and further allows for your introduction and replacement of CAD/CAM systems without having to reinvest in new post-processing and simulation technology which has been the expensive and painful norm in our industry since its inception. This freedom now allows you to make your post-processing and simulation software investment a part of your CNC machine investment, where it belongs! Furthermore, all ICAM products are regularly upgraded to accommodate changes to your CAD/CAM systems and CNC machines as they evolve. Investing in ICAM’s innovative and scalable technology can begin with just a single ICAM developed custom post-processor to which other ICAM software modules may be added at any time to create the complete Adaptive Post- Processing™ solution. Or at the other end of the spectrum, you may prefer to use ICAM’s complete Adaptive Post- Processing™ development platform to write and manage your own post-processors, machine simulation and optimization functions. All of these solutions are available from ICAM directly or via our network of ICAM trained dealers. So when it comes to Reducing your CAM programming time, Shortening your CNC machining time, giving you Access to Manufacturing Agility, providing CAD/CAM System Freedom while offering full Product Scalability – Think ICAM TECHNOLOGIES . .. Developing Adaptive Post-ProcessingTM and Simulation products with your business needs in mind. SmartCUT – Automatically Eliminate "air cuts"